Wedding is one of the most important days in lifeEvery girl. But, before celebrating the joyous reunion of two loving hearts, the holiday still needs to be prepared. What is required for this? Of course, weddings are completely different: someone wants such a celebration, so that in another couple of years everyone discusses this momentous event. And someone dreams of a quiet family celebration in the circle of the closest and loved ones. But anyway, a few mandatory attributes should be present at any wedding. To them we, undoubtedly, include wedding rings, icons and candles. 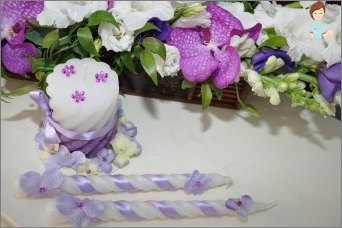 Wedding candles should be thin, long andWhite color. In the people it is believed that if you save the candles that were used in the ceremony of the wedding, then they will become a reliable guardian of your married couple. There is even an opinion that if there are any quarrels in the family, then you can light a wedding candle and leave it to burn for a few minutes. After this, all misunderstandings will be smoothed out, and peace and harmony will return to the family. One of the most touching traditions in anyThe wedding ceremony is the lighting of a candle for a home. This tradition appeared in those times when the hearth was used for cooking and was a source of heat in the house. That is why he was associated with the home cosiness. The basis of this tradition is the transfer of familyHearth from parents to their children, who just married. For the proper conduct of such a ritual, you need three candles. Home should be decorated with ribbons, flowers and beads. It will be stored in the new family as a relic, symbolizing the fortress and comfort. Rite is as follows. Two mothers take already lit candles and simultaneously light a candle-hearth of a new family. Thus, they seem to transfer a piece of their home coziness to their children's home. It is especially good if you light such a candle-hearth in the circle of guests, because you need to share your happiness with everyone. After the main candle has already been lit, allThree candles stew and fasten together with the help of wax. After the wedding ceremony ends, the bride takes them and carries them away to a new house. To keep such a relic is necessary for the rest of your life. For such purposes, thickCandles. But if you prefer a fine wax work of art, you can use a candlestick. Almost never future husband and wife buy ready-made candles. Most often they are made to order. So you can order any design for your home keeper. 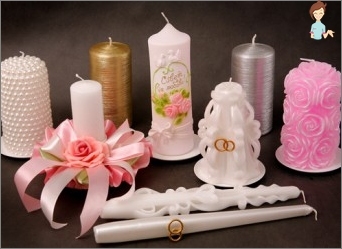 As we have already said, you can order weddingCandles. But if you have a small amount of time, you can try to create such beauty with your own hands. In this case, such a product will be even more symbolic, because the bride did it himself, preparing for a happy family life. Let's start, perhaps, with how you can make the candle itself. A toothpick, a clip or a match. The first thing you need to put the wick clearlyIn the middle of the candle shape. To ensure that during the filling of the wax, the wick is not displaced, we fix it with a clip or toothpick. Since there is a small hole in the bottom of the mold, you need to put it in a container with cold water. In this case, the wax will begin to harden quickly when it comes into contact with the cold. Attention! The height of the water in the tank should not be higher than two centimeters. After the wick is fixed and the shapePut in water, you can start pouring melted wax. This should be done very carefully, because one drop of such a wax on the skin can cause a fairly severe burn. To ensure that there are no air bubbles in the candle, you can pierce the hot wax in several places with a toothpick. When making candles, you can add andaroma oils. But at the same time, remember that when heated, the odor will increase significantly, so do not overdo it! And now, when you and I have been sorted out step by step how to make the candle itself, let's learn how to properly decorate it. Decor candles - a matter of responsibility, requiringCreativity and patience. Before proceeding with the design of the candle, be sure to consider the design in advance. After all, even from a small number of rhinestones and ribbons, you can make a very beautiful product, and frank bad taste. Therefore, it will be best if you draw something,That you want to transfer to a candle. Note that the wax can be applied to symbols that are of particular importance to your pair. Do not forget about the colored ribbons and artificial flowers. But remember that all materials should not easily ignite, otherwise instead of weddings you will extinguish a small fire. By the way, if you make a candle yourself, thenYou can add a little color to the melted wax. But do not use too dark colors. After all, at the wedding, all colors should be light and airy. Ideal in this case, fit beige,Pink or cream color. By the way, the design of glasses can be similar to the design of candles. So you can get a kind of original set for the wedding. So, let's consider one version of the decorationCandles. First, draw a heart on the wax. You can use a pencil for this. Now you need to cover the entire surface of the wax with white or creamy acrylic paint. But here the outline of the heart and its center is not painted. Then we can make several roses fromSatin ribbon. Each rose should be attached to a special sewing pin. So we will not stick them to the wax, but pin them. So we fix the flower much better on wax, and it will not be able to fall off at the most inopportune moment. Now select the outline of the heart with the help of beads. In order to keep them well you can use a special glue gun. Around the heart pinned previously made roses. You can place them chaotically, but you can in a clearly defined order. In general, here you can rely only on your taste. Attention! In order not to shred a piece of a candle with a needle, before starting to pierce the wax, just heat the tip of the needle on an open flame. In this case, the wax around the needle will gradually subtle, which will greatly facilitate the pinching procedure. With the help of glue, you can attach several beadsAnd to the roses themselves. 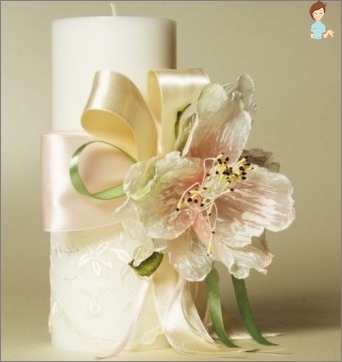 For an even more sophisticated design of wedding candles, you can use ordinary acrylic nail polish and a thin brush. So, you can draw around the heart a few curls, golden or silvery color. As a decoration you can use a bow ofGold or silver taffeta. It should be remembered that the bow must not be big, otherwise the whole charm of your product will be lost for too much detail. In the process of decorating wedding Candles with their own hands You can make a small podstavochku. For its production, you can use a small plate, and a piece of strong cardboard. If you chose the cardboard, then you need to paint it beautifully, and as an ornament you can use the same beads and roses, glued with a gun. So, we have analyzed how to make wedding candles step by step. As you can see, such a product will be able to add to your celebration an extra note of romance. In addition, by making Wedding candles with their hands, You put in them a piece of your soul that will protect your family. So take some time to create such a miracle with your own hand, and be sure that your family life will be long and happy!